We specialize in accounting, tax preparation, and notary services for a wide variety of clients. Annual participation in Continuing Professional Education courses offered by the NATP (National Association of Tax Professionals) keeps up on the leading edge of ever-changing tax laws. 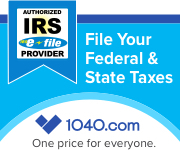 We are registered in multiple states, so no matter where you’re located, we can file your taxes. Mail them, fax them, or email us…we are ready to assist you! Whether you are an individual, operate a corporation, limited liability company or partnership, we can accommodate your needs for tax preparation.